Built Environment Forum Scotland (BEFS) has submitted its response to the Scottish Charity Law Consultation (open until the 1 April) submitted in its own right as a charity and circulated to inform wider organisational responses. 1 On the Scottish Charity Register, should OSCR be able to publish charity annual reports and accounts in full for all charities? Society is entitled to transparency for all organisations which enjoy tax and other privileges. But see answer 2 below. 2 Do you think there is any information in charity annual reports and accounts that should not be published on the Scottish Charity Register? Personal contact details of individual charity trustees. Their contacts should be shown as ‘c/o the Principal Contact Address’. For organisations registered as both a Charity and a Company the change makes little difference as these details would be available on Companies House. 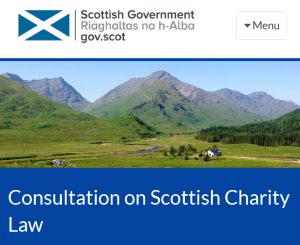 3 Do you think charities should be allowed to apply for a dispensation (exemption) from having their annual reports and accounts published in full on the Scottish Charity Register? 4 Should OSCR be able to collect the trustee information noted above for use in an internal database? 5 Should the names of trustees be published on the external public register? 6 Should the names of trustees who have been removed following an inquiry by OSCR, be published on the external public register? 7 Do you think trustees should be allowed to apply for a dispensation (exemption) from having their name published on the external public register? Yes, but only in extremely rare cases. A procedure would be needed for OSCR to authorise this. Exemptions may relate to potential release of service-user data – these charities should have an exemption in relation to the external public register allowing them to redact the necessary data. ie inadvertent release of service user data [eg – where service users are also trustees]. Question 4 – The internal database should hold all the information listed in Paras 34 & 35 above. The information available for external search should be limited to what is stated in Para 36. See Answer 2 above regarding charity trustees’ published addresses. Note that the current Trustee Declaration forms required by OSCR from those seeking to register a new charity in Scotland already call for full names, previous names, dates of birth, addresses, email addresses (when available) and telephone numbers, as well as a list of other Scottish Charities of which the applicants are trustees. 8 Should the criteria for disqualification and removal of charity trustees be extended to match the criteria in England and Wales? 9 Should the criteria for disqualification and removal also be extended to those in certain senior management positions? Question 8 – Yes – however SVCO raises the following question which would need to be addressed: the consultation paper does not go into enough detail to set the parameters of this alignment. For example, charities working with ex-offenders may want to include trustees on their board as part of their rehabilitation, and most convictions may not make an individual unsuitable to be a trustee. Question 9 – NO – Those in senior management positions should not be included under OSCR’s remit as that is operational, rather than governance, related. If the trustees have already been disqualified, OSCR must have faith in any new trustees to run the charity in a legal and proper manner. 10 Should OSCR be given a power to issue positive directions? 11 If you answered Yes to question 10, should a power to issue positive directions be wide ranging or a specific power? 12 If a charity failed to comply with a positive direction that OSCR had issued, should this be classed as trustee misconduct? Q 11 – A specific power – governance only, no operational directives. 13 Should OSCR be able to remove charities from the Scottish Charity Register if they have persistently failed to submit annual reports and accounts? 14 Should OSCR be given a positive power of direction to direct a charity to prepare annual reports and accounts? 15 If a charity failed to comply with a positive direction to prepare annual reports and accounts, do you think this should be classed as trustee misconduct? Q13 – definition of persistently to be clearly set out. Q15 – assuming due time and process has been allowed. 17 Should all charities registered in Scotland be required to have and retain a connection with Scotland? However, a charity registered in Scotland and with a principal address in Scotland and with at least one trustee resident in Scotland should be permitted to deliver all of its charitable purposes outside Scotland. Document Paragraph 62 summarises a reasonable outcome. 18 Should OSCR be able to make inquiries into former trustees of a body which is no longer a charity, a charity which has ceased to exist and individuals who were in management and control of a body which is no longer controlled by a charity? Both the charity and its last trustees should be subject to OSCR’s jurisdiction. 19 Should bodies that have de-registered as charities be required to continue to use the assets held at the time of removal from the Scottish Charity Register to provide public benefit? Scotland’s Charitable Purpose requirements should not superseded. SCVO adds, and BEFS supports: In some cases, additional restrictions may be required; for example, some collections held by Trusts that should not be capable of being sold for cash even if this is for charitable or public benefit. This will be specified in the charities’ articles and should only be overturned by an appropriate court order or Act of parliament. 20 Should OSCR be given the power to give the required notice of a request for information to a body or individual that is misrepresenting themselves as a charity, that is no longer charity, and to former trustees of a charity which has ceased to exist? Society supports charities because it is believed that they will at all times be fulfilling charitable purposed and providing public benefit. Misrepresentation and retaining assets previously held for those purposes should be subject to OSCR’s jurisdiction. 21 Should it be clarified that the notice periods to charities that are subject to a request for information can overlap? Clarification of timing for all parties can be nothing but useful. 22 Should the legislation be clarified to make clear whether OSCR can approve reorganisation schemes for certain charities that have been established by royal charter, warrant or enactment? Not unless there is additional legislation regarding these bodies, many of whom will be historic….